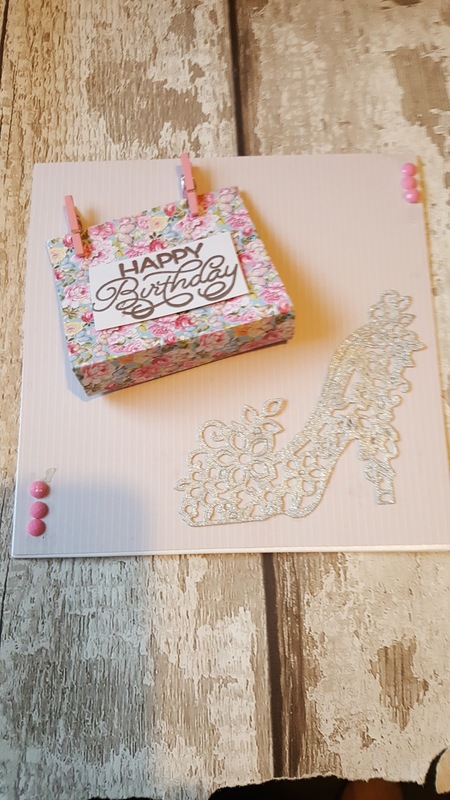 Firstly to make the card I chose a 6x6 white blank card, I mated the card with a piece of pale pink. I then made my handbag from the floral paper, you can see how I made the handbag in my you tube video which I will attatch. I cut the lovely shoe die from Silver card and stuck this at the bottom of the card, I then stuck the handbag on to my card. I stamped a sentiment with Silver embossing powder and heat embossed it. I then stuck my sentiment on to the bag using foam tape. I finished the card by adding some small pink gems to the top and bottom of my card.